The beginning of the football season means something outside the sporting world – that winter is just around the corner! In some places like Nevada, Wyoming, Colorado and northern California, the snow will not even wait until the official start of winter in December. Truckers need to begin planning for winter driving now. Those plans include key components – tires and tire chains. Owner-operators and large carriers, need to examine truck tires to make sure there is sufficient tread to make for a safe winter season. Just a trace of snow can be treacherous when tires are worn. As for tire chains, much of the planning centers around where your trucks normally travel and the various state laws having to do with chaining up. Truckers who operate from I-80 north should seriously consider carrying chains on board at all times. The same goes for many parts of Colorado between high I-80 and I-70. Weather can change rapidly enough that chains may be needed at a moment’s notice. Furthermore, the states are not necessarily cooperative in maintaining consistent laws across state lines. Below are two examples: California and Colorado. The law in California does not stipulate specific times of the year when chains are necessary. Chaining is a decision left entirely up to Caltrans. If the weather does necessitate chain use, officials from Caltrans will send out a bulletin and activate signs located along the affected roadways. It is then up to drivers to make sure their vehicles are in compliance. California has three different requirements depending on weather conditions and vehicles. For truck drivers, there is a choice between chains, cable chains, and spiders. However, cable chains are not permitted on some roadways under some weather conditions because they are not deemed reliable enough. Affected roots in California include Interstate 8, Interstate 15, U.S. Highway 50, Interstate 5, and a few others. The law in California is significantly different compared to other states, like Colorado for example. The chaining law in Colorado applies to every state, federal and interstate road in the state. Colorado has two levels of chaining requirements, depending on the severity of conditions. Furthermore, there are specific stretches of I-70 on which truck drivers are required to carry chains with them at all times from September through May. Colorado does offer chaining banks where drivers without chains can pick them up as needed. However, drivers are better off buying their own chains if they regularly pass through Colorado on I-70. Otherwise, it is too easy to arrive at a chain bank only to find there are none left. Drivers found in violation of the law could face fines of up to $500. Blocking traffic as a result of not chaining up could double that fine. Mytee Products carries a full line of tires and tire chains for America’s truckers. Our tire chains come in a variety of sizes, in both single and double configurations. If you do not see the right chains for your tires on our website, please contact us directly for more information. We may still be able to provide what you need. We also carry a full line of tires for drive, trailer, and all positions. Once again, you may not see the particular size you need for your rig on our website. Nevertheless, we can likely still provide what you need if you give our sales department a call. Winter is on its way so don’t get caught off guard by not having the right tires and tire chains. Prepare now before the first signs of snow fall. Driving in winter weather is just part of the over the road driving career. There is no way around it. As such, the vast majority of truck drivers have to think about tire chains from time to time. There are two questions to consider in this regard, the first being whether to purchase chains or to use chain banks along major routes that supply them. The second question is one of deciding whether to chain your truck or to park it instead. The answers to both questions really depend on the individual driver and how much risk he or she is willing to take. Ultimately, though, it is the driver who decides whether to proceed in bad weather or not. Federal and state laws prevent employers or dispatchers from forcing drivers to continue driving when they believe weather conditions endanger their safety. 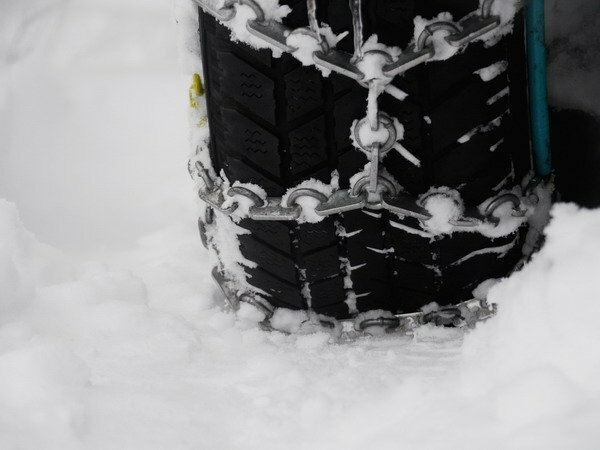 Tire chains are available in two basic options: the ladder design and the zigzag design. The ladder chains looks just like a mini version of an aluminum ladder you use to paint your home, except that it’s made with chain links instead of pieces of aluminum. The ‘steps’ of the chain ladder go across the horizontal surface of the tire while the rails fit over the side. The zigzag tire chain looks a lot like a shoelace, crossing from one side of the tire to the other. A zigzag chain can consist of one or two ‘laces’ held together by two side rails. Some truck drivers prefer this pattern because they believe it provides extra bite; others prefer the ladder design. Regardless of which type a driver chooses, the chains are applied to the tires and held in place with either additional chains, bungee cords, or rubber rope. It is important for drivers to check chains within a few hundred yards of installation to make sure they are tightly secured. It is possible for chains to fall off during travel if not properly secured. The states have different regulations when it comes to tire chains. For example, California does not require truckers to use chains in a general sense. However, police do have the authority to prevent truckers from entering certain roadways, under certain weather conditions, without chains. Colorado is a bit stricter. The laws in Colorado apply to every interstate and state and federal highway when weather conditions warrant. When the regulations are in effect, DOT officials post signs along roadways warning truckers to chain up. Chains can only be removed when bare pavement is encountered on a descending grade. Truck drivers ultimately have to decide whether or not to chain or to park. Having said that, some trucking companies have established policies indicating they do not want their drivers ever using chains. If weather were bad enough to require chaining, these companies would prefer drivers pull over and park their rigs instead. They do not want to risk driver or equipment in such bad weather. Independent contractors do not have the luxury of a company policy making chaining decisions for them. Therefore, they have to consider their own schedules and financial requirements. The one thing that should always be remembered is that human beings cannot be replaced. Delivery schedules can be changed, extra work can be taken to make up for lost income, and equipment can be repaired or replaced. However, a dead trucker is a dead trucker. Chains are appropriate in certain weather conditions and inappropriate in others. At the end of the day, a driver needs to be objective when it comes to deciding between chaining and parking.